March 20, 2019 - DUBAI, UAE -- More than 100 coaches from different football academies and Dubai clubs participated in the annual forum for coaches, which was organised by Dubai Sports Council under the supervision of top technical specialists and experts. 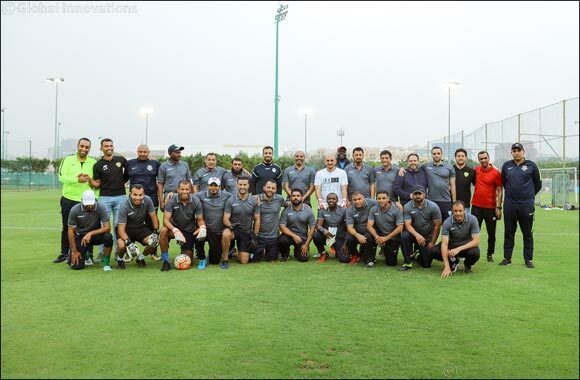 The four-day Annual Forum for Coaches, being organized for the sixth successive year, took place at Shabab Al Ahli Dubai Club and came to a close on Wednesday, March 20, 2019. As part of the Forum, three training sessions were held throughout four days, comprising lectures and theoretical and practical workshops. The first session was allocated for coaches of 13 to 18 years old, while the second session was dedicated for coaches of 6 to 12 years old and the third session was for goalkeeping coaches. The lectures were given by Berard Schum, Technical Manager of Ajman Club and Former International Lecturer in UAE Football Association; Kayo Zanardi, Technical Manager of Al Nasr Academy; Jan Van, Technical Manager of Shabab Al Ahli Dubai Football Academy; Filippo Tradouchi, Representative of Way Scout International Football Analysis Co; Richard Michel, Technical Manager of Al Wasl Football Academy; Abdul Naser Maydoni, Technical Manager of Hatta Football Academy; and Saif Rond, Technical Manager of Emirates Football Academy. The goalkeepers' workshop was supervised by Zakariya Ahmed, Lecturer in UAE Football Association and Asian Football Confederation, Naser Khamis, Coach of UAE National Team Goalkeepers and former lecturer in the UAE Football Association, and Khamis Salim, Goalkeepers' Supervisor in Al Nasr Sports Club. The Forum dealt with various topics. The first session comprised theoretical and practical lectures for coaches of 13 to 18 years old category and discussed several matters like game style, attacking strategy, taking of fast decisions, advanced techniques in football. This session focused on means of rectifying points of weakness and boosting points of strength. The second session, targeting coaches of 6 to 12 years old, reviewed the technical development of football and dealt with strategies of exploiting smart methods in coaching and taking proper decisions during competitions. The goalkeepers workshop dealt with attack building, goalkeeper support, using foot to pass ball and strategies to be followed by goalkeeper in case of direct confrontation vs. other team's striker. This Forum is organised annually as part of Dubai Sports Council's program to boost technical level of juniors and youth, and to enhance the competence of coaches who work in academies and football companies of Dubai. It is also arranged in the same context of other football coaches' courses; parts of which are external training courses for assistant coaches in Dubai football companies, held in collaboration with the Football Associations of France, Germany, Italy, Portugal and Spain. Several other specialised training courses were also arranged in this respect.